ITM Platform calculates the costs of tasks and projects based on the professional profiles (categories) and at standard costs and rates. ITM Platform employs a classification of professional profiles. To assign a user to a task or activity they must have been assigned to at least one position within the organization which will in turn link them to a profile. The only required detail which you must provide is the Category Name 2. This allows ITM Platform to calculate the cost estimates and actual costs based on the professional profile the individual belongs to. The recommendation is to use profiles known to the organization, or otherwise profiles accepted in the profession. For example, in the case of IT this could be engineer, analyst, marketing technician, etc. 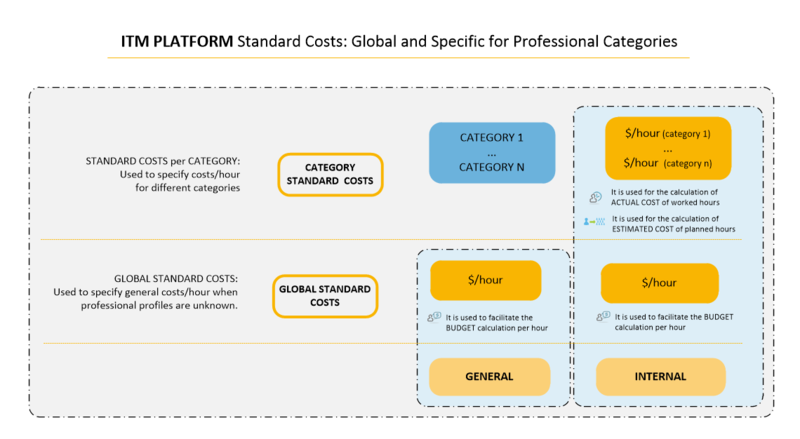 ITM Platform calculates the costs of tasks and projects based on the professional profiles and at standard costs and rates, and can distinguish costs according to the following types: global standard cost and cost by profile or category. Go to the menu ORGANIZATION, COSTING option, and select Category And Rates. On Global Standard Cost 1 indicates the cost types if neither the working team nor the corresponding professional profile has been defined. In the section Categories Standard Cost 2 the standard costs are created for internal personnel. The following layout shows how costs are defined and used in ITM Platform.